A generator control unit integrates a 3-Phase Generator Control Module, a Circuit Breaker controllers, a Belt Alternator Monitoring module, an Engine Control & Monitoring system and a serial Data Interface RS485. 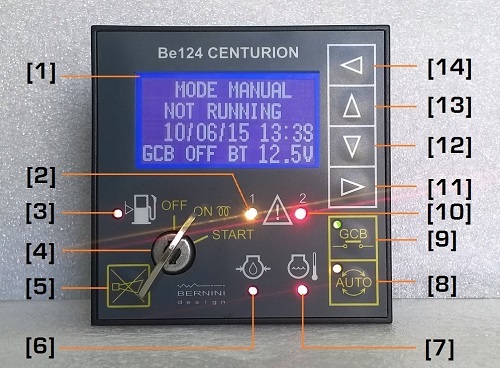 The Be124 controller provides clear visual indication by means of LEDs and Display for all supervised parameters and alarms. It features a range of programmable settings and is engineered to comply with international standards. A CANBUS interface communicates with engines equipped with ECU according to the SAE-1939 standard. In the image you can observe the front panel of the Be124 generator control unit.